HALIFAX / K’JIPUKTUK IN MI’KMAQ TERRITORY: A dozen climate justice activists gathered in front of the Halifax Convention Centre to greet Royal Bank of Canada (RBC) shareholders for their 2019 Annual general meeting for common shareholders. 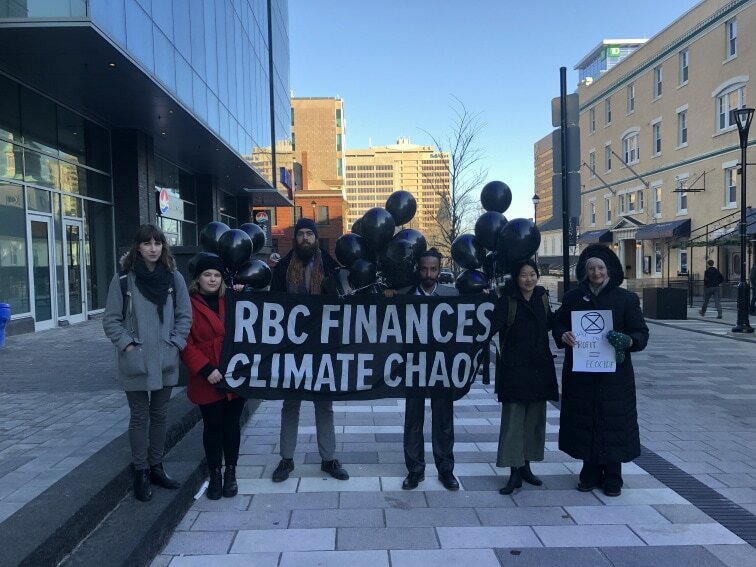 Before the meeting officially commenced at 9:30am, the activists attempted to deploy a floating banner inside the convention centre that read “RBC Finances Climate Chaos” — until they were intercepted by security. In addition, the activists distributed a “fossil fuel finance report card” to the shareholders that urged RBC to immediately end financing new fossil fuel projects, and begin phasing-out its current financing of existing projects. In March 2019, a major report was released by some of the world’s leading environmental action organizations, including Indigenous Environmental Network, Sierra Club, Oil Change International and Rainforest Action Network, ranking RBC, TD Canada and ScotiaBank in the world’s top 10 worst “fossil banks” financing fossil fuel projects. RBC is ranked Canada’s #1 “fossil bank” for being the biggest funder of the Alberta tar sands. Since 2016, RBC has financed over $100 billion USD towards fossil fuel development. 2016 was also the year that world leaders signed the Paris Agreement to commit to maintaining less than a 2-degree global temperature increase – which would require collective action from all sectors and actors (including banks) to reduce reliance on fossil fuels, and end extractive fossil fuel development. RBC’s 2019 Fossil Fuel Finance Report Card can be found here.